We chose to encrust this filet with walnuts to not only add omega-3’s and antioxidants to your meal, but also to offer a rich and nutty complexity that you are sure to thank us for. Complimented with colorful vegetables, this dish is not only pleasing to the eye, but to the mind and body as well. Preheat oven to 400 degrees. Wash potatoes, but leave unpeeled. Brush olive oil over potatoes. Sprinkle with kosher salt and pepper. Place rosemary springs on top of potatoes, and bake on a sheet pan for 15-20 minutes or until golden brown. Place asparagus in a pot of boiling, salted water and continue to boil for 3-4 minutes, depending on thickness of asparagus. Chock the asparagus in a bowl of ice water (this is so they remain green). Remove asparagus from ice water and dry them between paper towels. Be sure to dry very well, as doing so will allow grill marks to appear on the asparagus. Brush with 1 tbsp. olive oil, and place them on a grill pan. Sprinkle parmesan cheese over the asparagus, and place into preheated oven for 3-4 minutes or until parmesan melts. Assure oven is heated to 400 degrees. Place crushed walnuts on top rack of oven for 3 minutes or until walnuts are toasted, taking note not to over-toast. Place 1 tbsp. peanut oil on each side of filet as well as salt and pepper to taste. Lay crushed walnuts on plate. Place filet on plate and press down until one side is completely covered with walnuts. 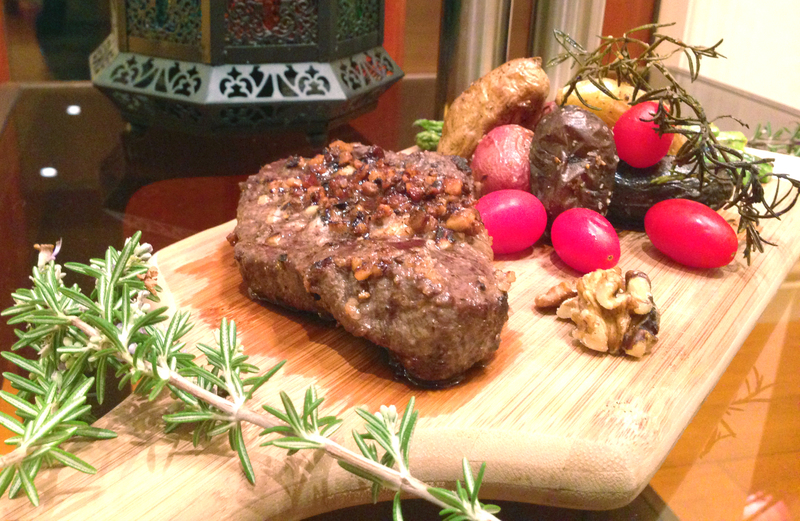 Place walnut side of filet on cast iron skillet, and place in oven for 4 minutes. Remove from oven, turn filet over with kitchen prongs and place back in oven for another 4 minutes. Remove from oven and place ½ tsp butter on each of the filet. For a medium cooked steak, continue cooking in oven for 6 minutes. Cook 8 minutes for a medium well steak, and 11 minutes for a well-done steak (which is a crime)! Combine 1 filet, 3 fingerling potatoes, and ½ bunch of asparagus on each plate and serve. Bon Appétit!